H.H. 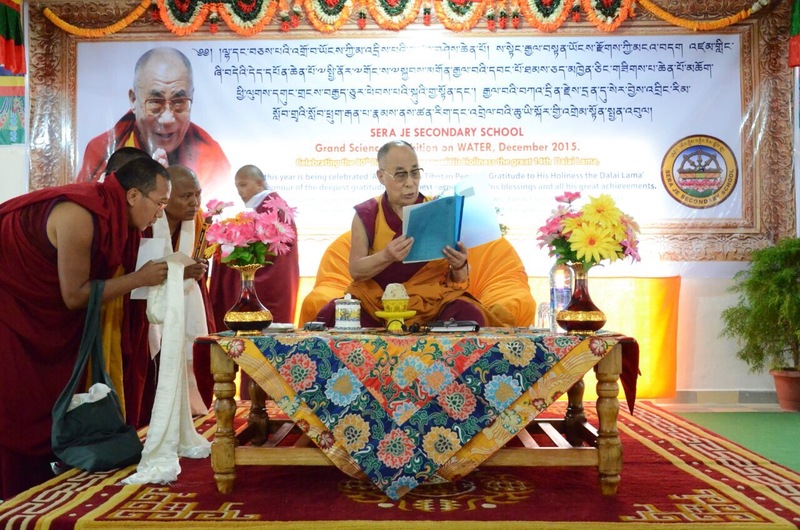 the Dalai Lama given lecture to teachers, students and staffs of Sera Je Secondary School on 15th Dec 2015. First of all I am conveying my Tashi Delek to you all teachers, students and staffs. Now as usual I have been explaining, when speaking about Nalanda, an ancient Buddhist monastery of that time, it is not like an ancient monastery were many monks gathered to assembly only. It is during that time an important educational Institute before becoming a Buddhist Monastic Institution, where one can pursue study on five major cultures and five small cultures, the once which we are studying. Before the period of Nagarjuna and his disciples, it was an important educational centre. It gradually becomes a Buddhist Monastic Institution as Buddhist scholars joined the Nalanda. Accordingly, despite the existence of different views and tenets for study, there evolved a value based study on Buddhism with the main study of psychological subject and others so on. Gradually, the Nalanda became a Buddhist University. So, if we look on to ancient history, during that time the study was not based on single subject. There being existence of many subjects of study, it became a full fledge educational institute which was recognized by everyone. Right now, we Tibetans are students of Nalanda Tradition. As I have connections with many places in this world. I explain that in this world, there are many Buddhist countries where there are almost one billion Buddhists and from amongst these, the thought of great masters of Nalanda, Nagajuna and Asang-Ga and their followers, especially philosophically logics. These are studied for many years and preserved in this world by Tibetans. There is no one else except us, Tibetans, which are keeping those texts and as such we really can be proud of it. The texts of such philosophical and logics can be explained fully in Tibetan language itself without relying on Sanskrit and Pali. These days one who seek and wish study the texts of the scholars of Nalanda masters are trying hard to study Tibetan language. 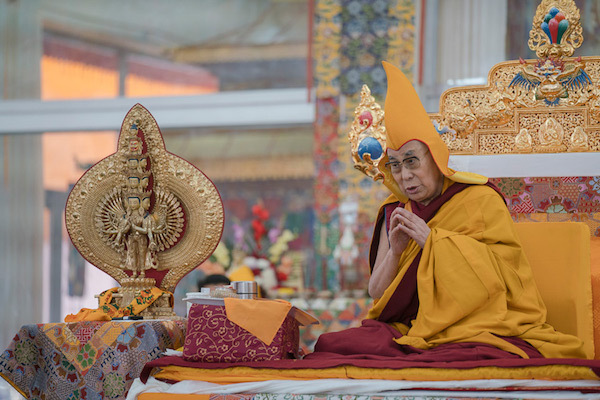 Without knowing the Tibetan Language properly and relying only on dictionary, for example as we call Ultimate truth, for that the details of differences in views as in upper and lower Tantras, which dictionaries cannot show in detail. In such a cases, when we call Ultimate truth. As Lama Tsongkhapa said in "Path to the Stages to Enlightenment". The importance of meditation is not only single pointed meditation. Because if we say the meditation is only the single pointed meditation, then it is like that we are saying all the disease must be a particular disease. In meditation also there were analytical meditation etc. So as in this example, those who explain with looking from the dictionaries explain direct meaning but cannot explain the details and profound meaning. To study properly the deeper meaning of texts you need to have the knowledge of Tibetan Language. It is wonderful that in our monasteries we have all those fields of study available in our language. We must feel gratitude of our ancestors. Our country Tibet is a poor county, but there were opportunities to study and especially study on great texts which scholars study hard for many years memorize the root texts and listen to the commentaries by each word. Debating in Dharma courtyard and examine minutely in Dharma courtyard is very unique system of study. If we say anything about the insufficiency and incomplete in our education system which we preserved during several hundred years. Then there are many modern educational subjects but the most important thing is the inclusion of some information on metaphysics in our texts. You all studying here will definitely in future, could contribute in improving the educational standard of not just among the monk communities but also laypersons. The Educational standard based on the combination of our Traditional Knowledge and the modern educational standard. Right.., Developments in the external materialistic life and the studies on the Environment and with the inclusion of all the subjects which needs our attention. Above this the main important Environment is the Environment of our inner self. If we have good and clean environment in this world, but when poisons of three afflictive emotions generates negativities and pollute our inner environment, there are a lot of problems. For us Tibetans, to clean our inner environment, we have to do it not only by faith and prayers but we have to think over reasons. The way of think over reasons are really great and helpful. So, all the hard work you have put is altruistic thing and will definitely be very beneficial to others in future. At the same time, this definitely is a big contribution for the Tibetan Culture and help in Tibetan positive fame. Understand! I wish to say thank you. Work hard and be careful. Just then, the things described by you (in the Science Exhibition) are explained in our Interdependence subject. "External vessels, Internal animate being", thus earth, water, fire, and airs too are depending on each other. For our inner elements, these bodies and aggregates are depending on each other and top of that if we have to make happy and peaceful external vessels it depends upon many causes and conditions. Thus, to have inner peace of mind it depends upon many causes and conditions. In general Buddha's teaching of interdependency has great relevancy and is really great thing. Understand! Keeping this as the basis of our studies, over that we add metaphysics and psychology. All of you students make effort on your study and study well. In future, when you young people become senior or elder monk, you must be able to explain without any obstructions on any subjects. Understand.., so, do like that.